Dirt is a block that can have trees and other naturally generated plants placed on it. Dirt can be broken by hand, but using a shovel will speed up the process. Dirt has a 0.36% chance of being caught while fishing with an unenchanted fishing rod. It is part of the junk category. This makes dirt technically renewable. It is very easily found in forest biomes, plain biomes, mountain biomes, and mushroom biomes. 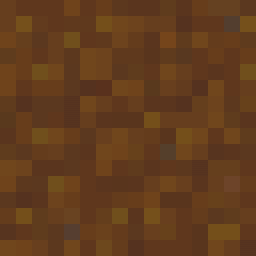 When a block of dirt has no solid blocks at least up to 3 blocks above it, it will eventually switch to a grass block. When tilled with a hoe, it switches to farmland. Dirt is good for growing trees, bamboo and sugarcane. Itself and grass are the only block that passive mobs, such as pigs and cows, spawn on. Since the dirt block only checks 3 blocks above it, it maybe change to grass underground. Easily get rid of the dirt when using acid. This page was last edited on 5 July 2018, at 12:22.